The Zero Carbon Co.Lab aim was to modify and manipulate an existing Victorian house into a house that was zero carbon – or better a house with negative carbon figures. I picked this particular project as it fascinated me that buildings today could produce zero carbon emissions and that I could use this knowledge and use it in my current projects during architecture school. 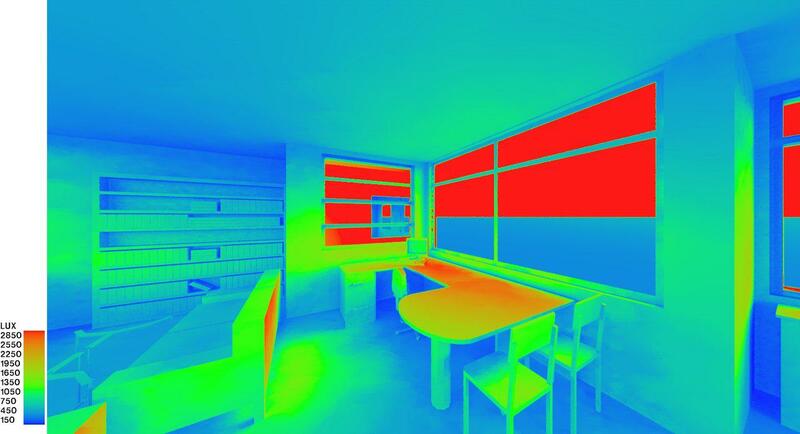 The way we created this zero carbon house was through software called Virtual Environment. On the similar basis to BIM, Virtual Environment models the building but also models all the systems that go into the building such as insulation and HVAC systems. Virtual Environment is able to produce images such as the one above, which, in this case, show where the greatest amount of light comes from and where light is is not able to reach certain parts of the room. For this to become a successful project we worked with 4 Masters student who were succinct with this software and helped us achieve the desired goal. Weekly one hour meetings enabled ourselves to become proficient at the software to achieve a zero carbon house. With the goal set, we started to address the fabric of the building, this included the walls, floors, ceilings, doors and windows. By altering these components to today’s standards and making them further energy efficient this significantly reduced the carbon emissions from 12000kg CO2 to 7000 kg CO2. Thereafter, we addressed issues such as water being used within the building. We found that water was being used in places such as the bedrooms and living area of the building which was causing profound increases in the CO2 emissions. So, by reducing this the carbon emissions fell accordingly. Heating profiles which set the temperature of the property and when the heating system would come on would also reduce carbon emissions and the system was turning on at unnecessary times throughout the year and throughout the day. Therefore we set a profile that meant that the property was vacant throughout the day but had occupants during evening and morning meaning that the heating system would turn on. Having resolved all these issues, we reached a point where the the annual CO2 emissions was not reducing from 200kg, however, introducing alternative ways of producing energy such as installing solar Photo Voltaic cells reduced the carbon emissions to -200kg CO2. Thus reaching our aim. After this project, the knowledge and understanding gained from such drastic actions meant that in an ever changing world of architecture, and the issues surrounding global warming, the steps taken to achieve a zero carbon house can be worked upon on new and existing properties.